Welcome back. Several years ago, I blogged about a species of bat whose tongue is longer than its body (The Ecuadorian Bat). I began that post by describing how I’d once swung a broom, baseball-bat style, to annihilate a bat flying frantically in our living room. I also confessed to later feeling remorse, explaining, Who knew of the ecological and economic importance of bats? In those years, Batman dressed the part, yet Dracula was their only spokesperson. Yes, like other mammals, bats can carry rabies and other diseases, bugs and ticks, and yes, under the right conditions, their feces (guano) can transmit disease. But many of the more than 1200 bat species consume vast quantities of insects (including mosquitoes! ), annually saving agriculture billions of dollars in pest control. 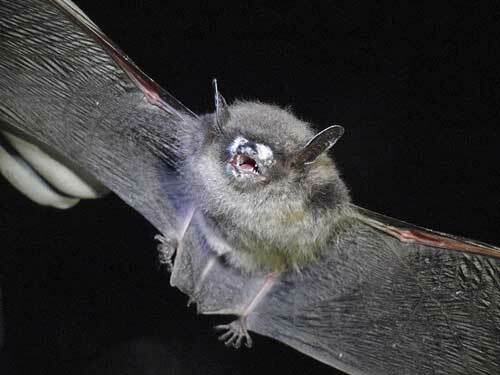 Other bats pollinate plants; fruit-eating bats disperse seeds. And guano? It’s a valuable resource that’s been used as a fertilizer for centuries. You’ll find it online and in your local retail stores. Little brown bat with symptoms of white-nose syndrome in N.C. I wrapped up that 2012 blog post noting bats are in trouble, and it’s gotten worse. White-nose syndrome, caused by the fungal pathogen Pseudogymnoascus destructans (P. destructans), has killed millions of bats in North America since it was first documented in New York State in 2006. One of the most severe wildlife diseases ever recorded, it has now spread to 33 states and 7 of Canada’s 10 provinces. The long-term effects will not be known for decades. The P. destructans fungus infects skin of the bat muzzle, ears and wings. Bats are infected during winter hibernation when their body temperature lowers to the temperature growth range of the cold-loving fungus, about 39-68°F (4–20°C). Once infected, irritation from the fungus causes frequent awakening from hibernation, increasing the amount of energy the bats would otherwise use. Infected bats experience depleted fat reserves, weight loss, dehydration, electrolyte imbalances and death. Cluster of little brown bats with symptoms of white-nose syndrome in N.Y.
Signs of the disease include visible white fungal growth, excessive or unexplained deaths at the hibernation site, abnormal hibernation activity and wing damage. Notably, these clinical signs likely reflect more advanced disease stages. In a study published about a year ago, collaborating scientists from the U.S. Forest Service, U.S. Department of Agriculture and the University of New Hampshire sought to gain insight into the origins and adaptations of P. destructans through genome annotation--identifying the locations of genes and all of the coding regions in a genome, and determining what the genes do. The researchers generated annotated genomes for P. destructans and six non-pathogenic species of the same genus. Through comparative genomics, they discovered that P. destructans lacked a key DNA-repair enzyme. To test this potential vulnerability, they exposed the seven Pseudogymnoascus species to four DNA-damaging agents: ultraviolet (UV) light and three chemical agents (methyl methanesulfonate, 4-nitroquinoline and camptothecin). 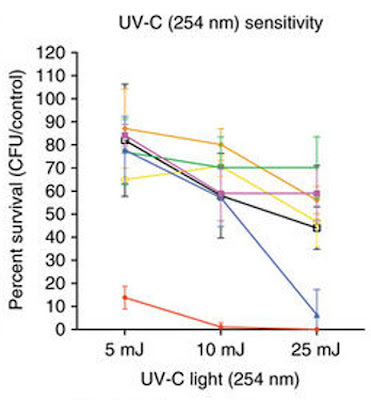 P. destructans exhibited extreme sensitivity to UV light. This led to further testing with different wavelengths and intensities of UV light. They found the fungus was especially sensitive to the UV light wavelength of 254 nanometers. A moderate dose exposure, which could be achieved in only a few seconds, killed over 99%. Percent survival of colony forming units of Pseudogymnoascus destructans (bottom, orange graph) and six non-pathogenic Pseudogymnoascus species (other graphs) exposed to three intensities of UV light of 254 nm. Methods to treat white nose syndrome with UV light are being actively pursued; however, the challenge of saving or protecting populations of bats in their natural environment is immense. Along with pointing to the fungus’s vulnerability to UV light, the study produced one other finding of interest. The genomics analyses suggest that P. destructans evolved alongside Eurasian bat species for millions of years. Unlike in North America, its presence in Europe and Asia does not cause significant mortality.